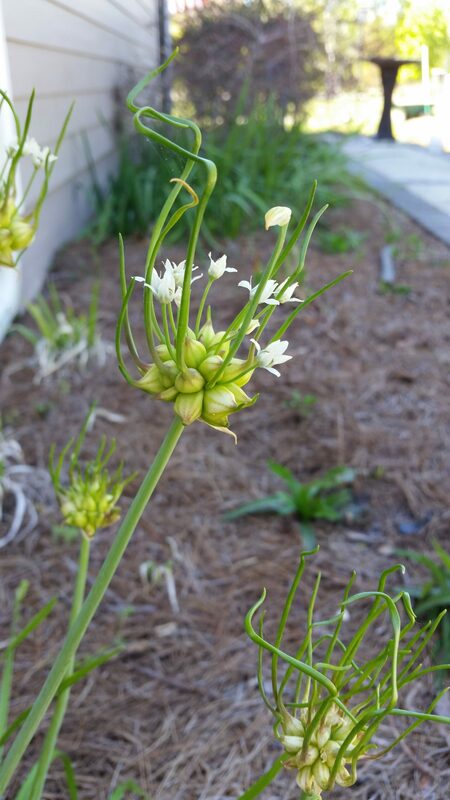 As spring arrived – after the late March refreeze that killed my pear blossoms, fig leaves, orange stems and fooled the usually infallible pecan trees – these strange stalks pushed up. I must have planted SOMETHING in this bed. I have irises, crinum lilies, gloriosa lilies, stokesias and agapanthas in this bed. 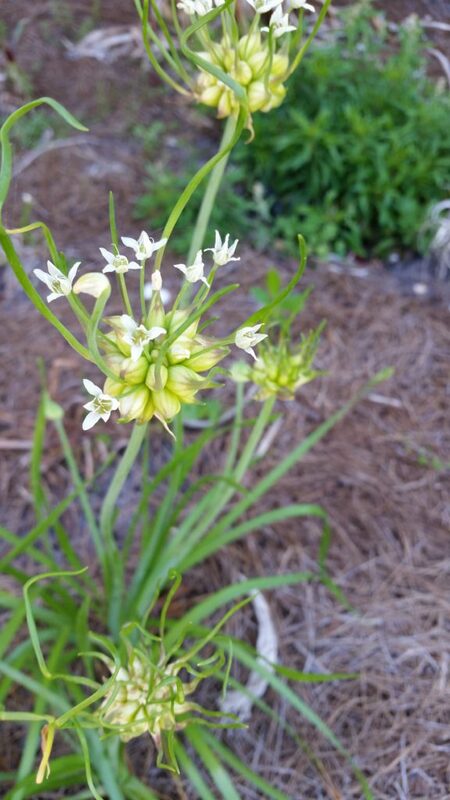 And now I have these odd, unidentified bulbs. They appear to be a walking variety. I like them very much. They are strange, unique and uncommon. My bee hive has gone from a feeble, anemic cluster of bees occupying a brood box but lacking brood cells, larvae, pollen stores and honey. 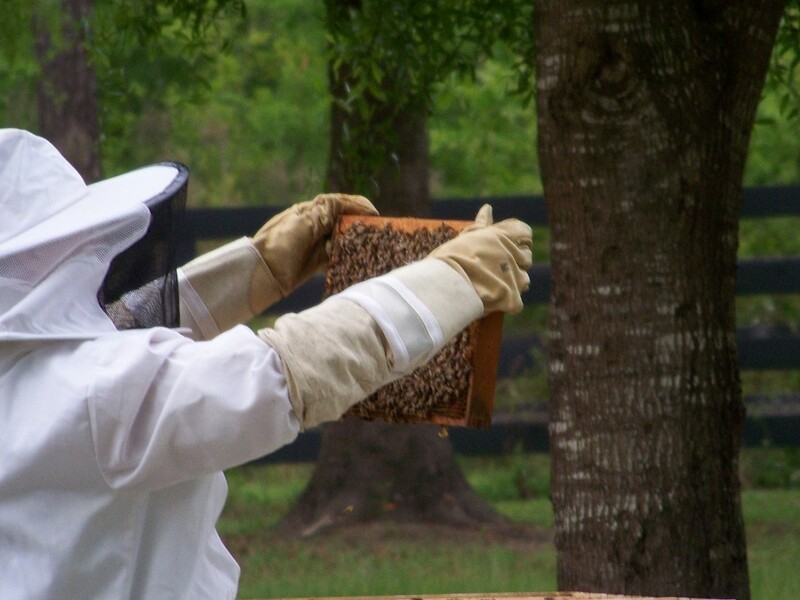 As last summer closed, I was uncertain if the hive would survive. But, I relocated them to a smaller box – and I fed them. A lot. And they rebounded. The colony is quite robust and active. I added a second super for honey storage and a green drone frame to try and mitigate varroa mite reproduction. 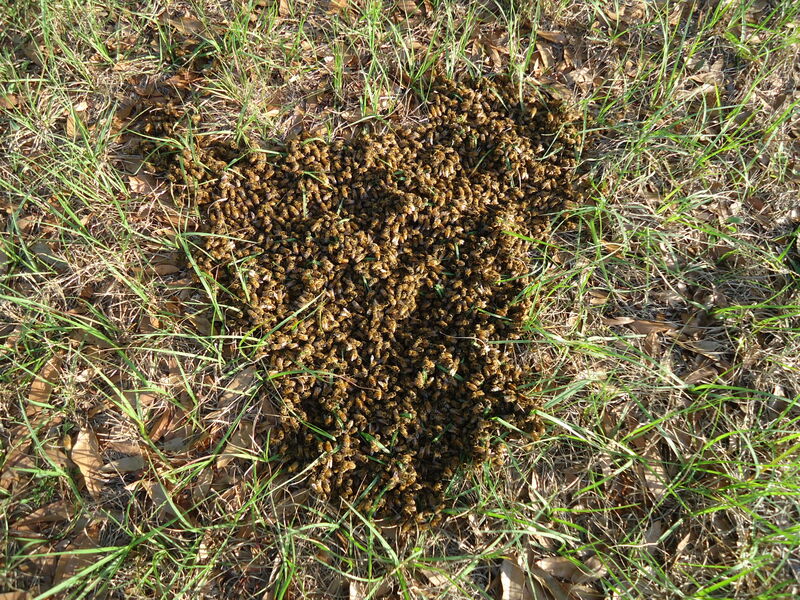 And today, it is possible that the hive split and part of the colony swarmed away. They didn’t go far. As I walked out to check on the newer, feral, cut-out colony I installed Saturday, I kept hearing bees zinging past me is all directions. I looked down and found a puddle of bees on the ground. I was determined to catch this swarm and relocate them into a new box. I had just bought a Nuk. It’s not yet painted . I swabbed the inside with lemongrass extract and swept the bees into the hive. They marched right in. I found the queen in a ball of attendants still in the grass and dropped her in the top of the box. Now I have three hives. 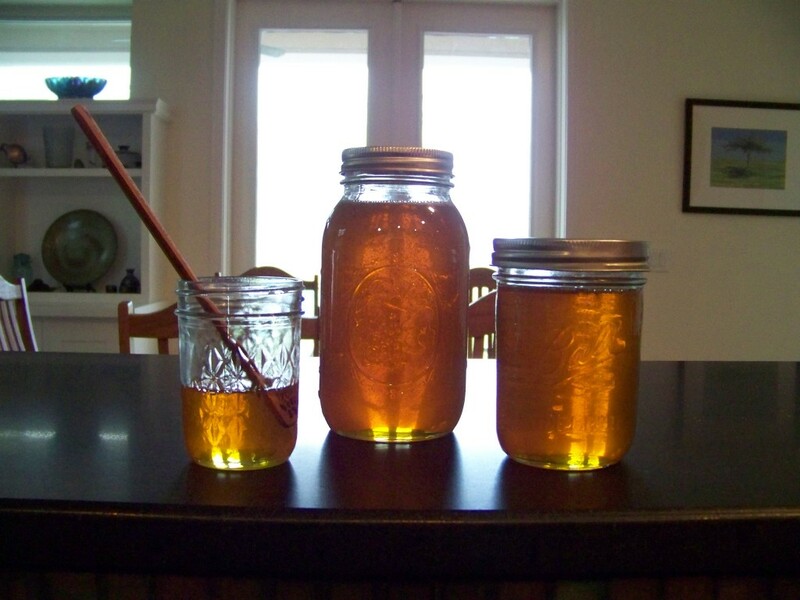 And the honey is starting to flow. Time to upgrade to deep brood boxes. Dadant is going to get all my extra money this month. 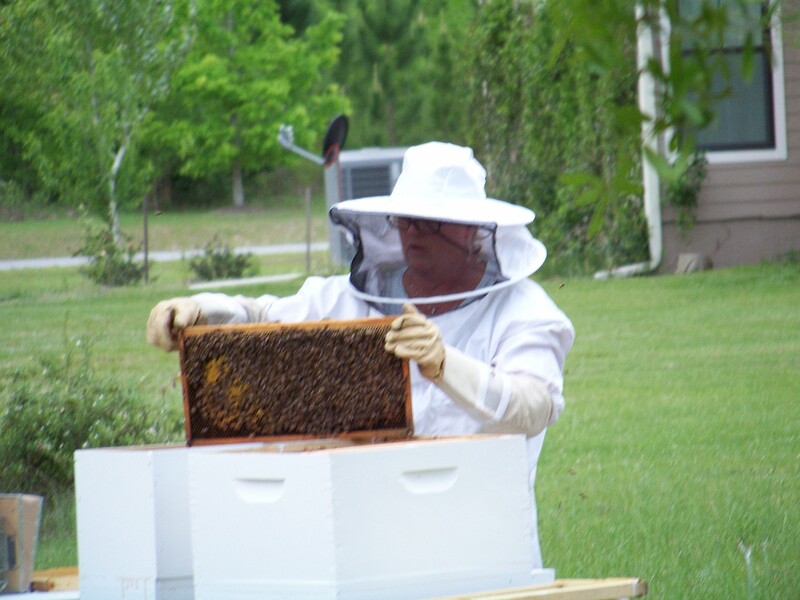 I am in no way expert but I am an enthusiastic backyard beekeeper. I know I am supposed to rob the hive. The whole point is to collect honey but I often think of them like a pasture of cows or goats. I just want them to have a happy home and range to make a healthy hive. 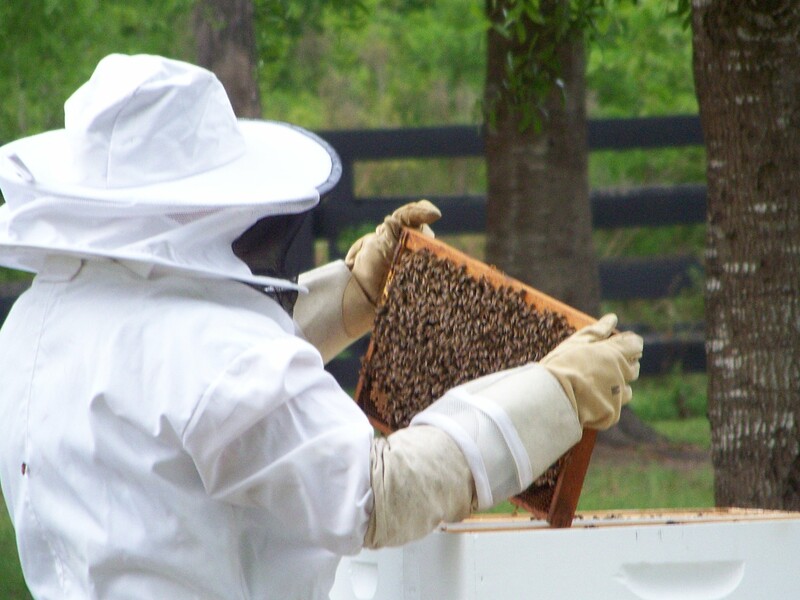 I worry that robbing the hive stresses them and causes them to be at risk of pests and disease. 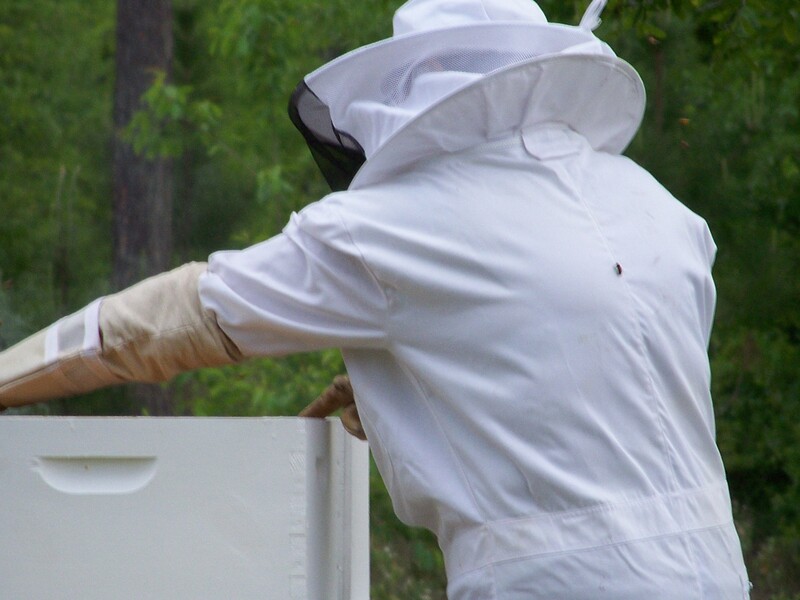 Maybe that is why, in some Freudian way, I am ill prepared to rob the hive. I do not have any standard frames in my freezer to replace the honey packed frames I found in the hive this morning. 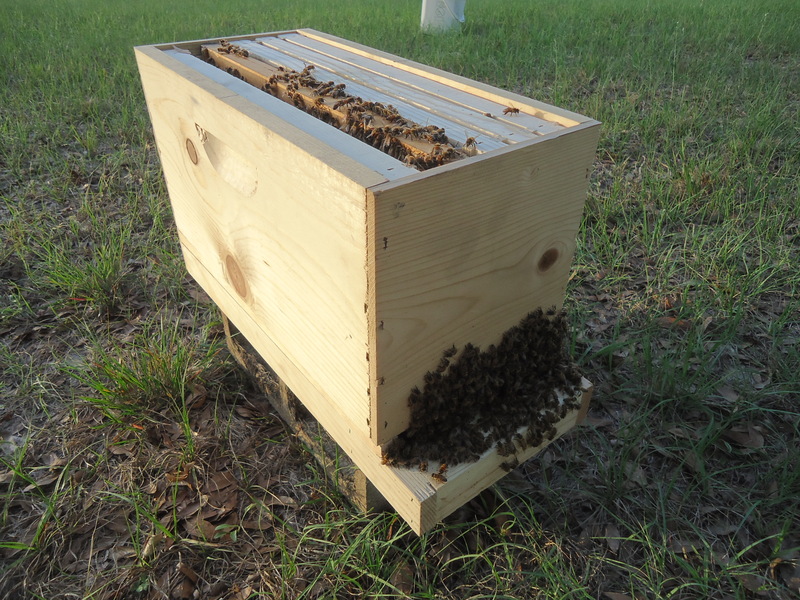 Late Wednesday afternoon, I added a second box to the beehive. The boys and girls are active and the hive seems to be thriving. I encountered bees in the garden on the tomatoes and cucumber blossoms. The are all over the asters and wild daisies. But more than anything they are all over the blackberries. 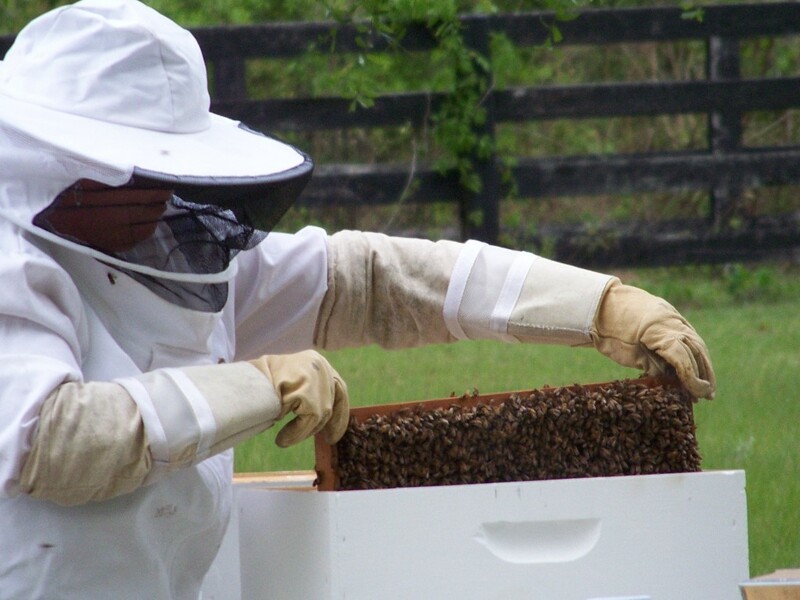 Opening the hive is always exciting. I want to find the queen. I slowly and patiently went over every frame. 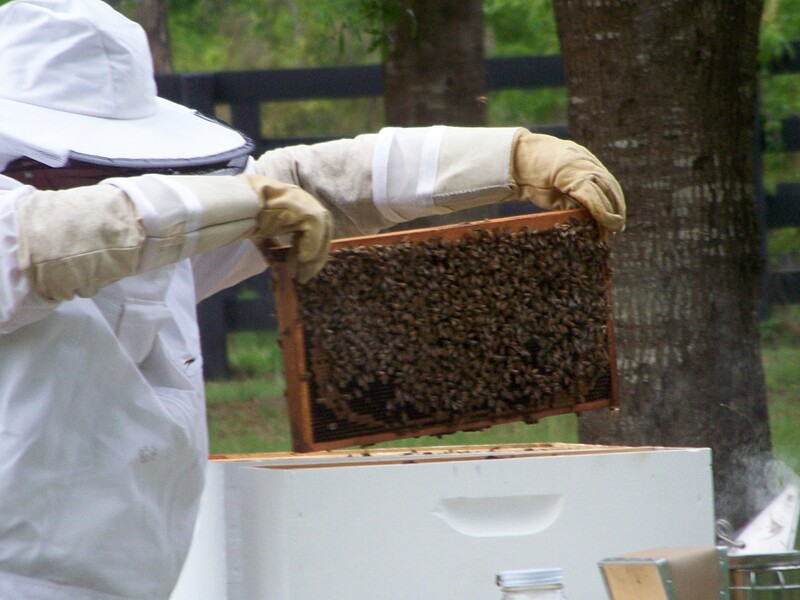 Two frames, four sides, are capped brood. There are larvae in another and honey on one frame. The drones and workers are very active but thankfully not aggressive. But alas, no queen. She’s in there. Evidence of her is all over. I think in one more week, I will need to put on a second box. The 5 frame Nuk box got upgraded to a regular 10 frame brood box. The bees were fairly docile which I attribute to a cooler night. Once I noticed that all the sugar water was gone, I knew it was time to move them. I didn’t find the queen but considering how much the brood has grown in the last five days, I would say she is young and hearty. My enthusiasm gets ahead of me sometimes. Sometimes as easily as my pessimism can knock my feet out from under me. I went out this morning to check on the bees and to replace the sugar water. 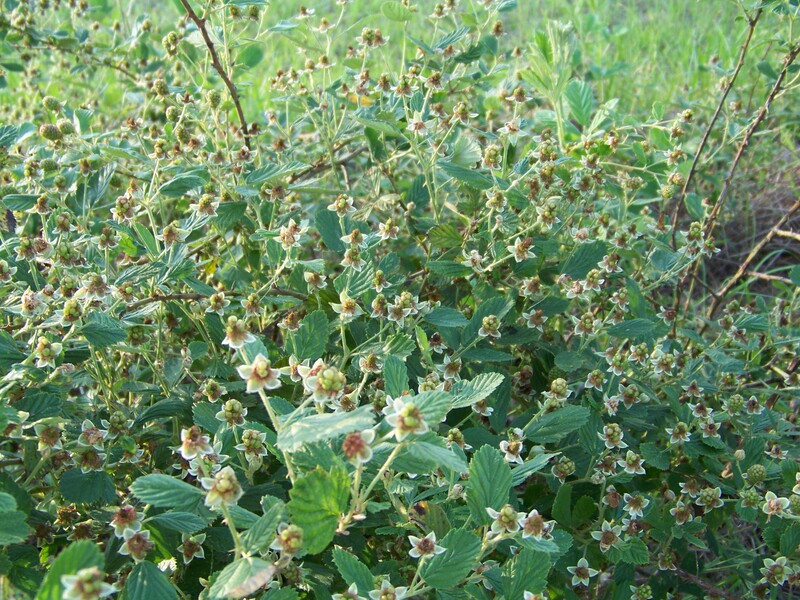 I’ve been less that diligent about the sugar welfare, as I think there is plenty of pollen and nectar in the wild blackberries, flowers and grasses in the neighborhood. 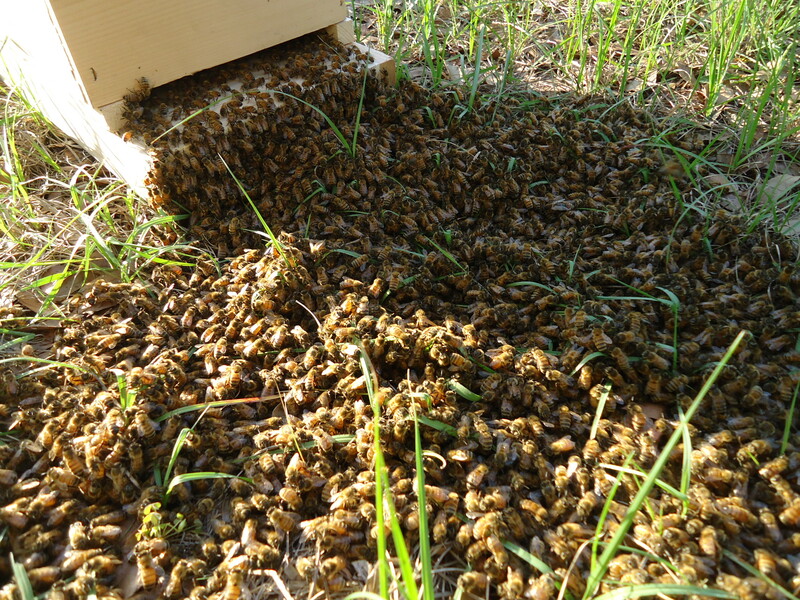 Unfortunately, my second hive has collapsed…or swarmed. I can’t tell. But the hive box is abandoned and the next door neighbor bees have hacked the hive like a bunch of squatters and crackheads. The comb is also occupied by some moths and some kind of webweaver insect that I could not find. Only their webs served as proof of their existence. I have been overly hopeful that bees, given a hive and a place to roam and gather pollen will capitalize on the free housing. In exchange, they’d give me some honey and pollinate my flowers and fruit trees. I am sent back to the drawing boards, chat boards and text books to figure out what I am missing. I woke before the sun and set coffee to brew and then headed to the southern property line just as the sun crested the distant eastern horizon. 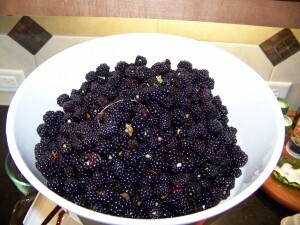 Blackberries destined for my Le Creuset kettle and a fancy half pint Ball jar needed picking. The season for berries is early. 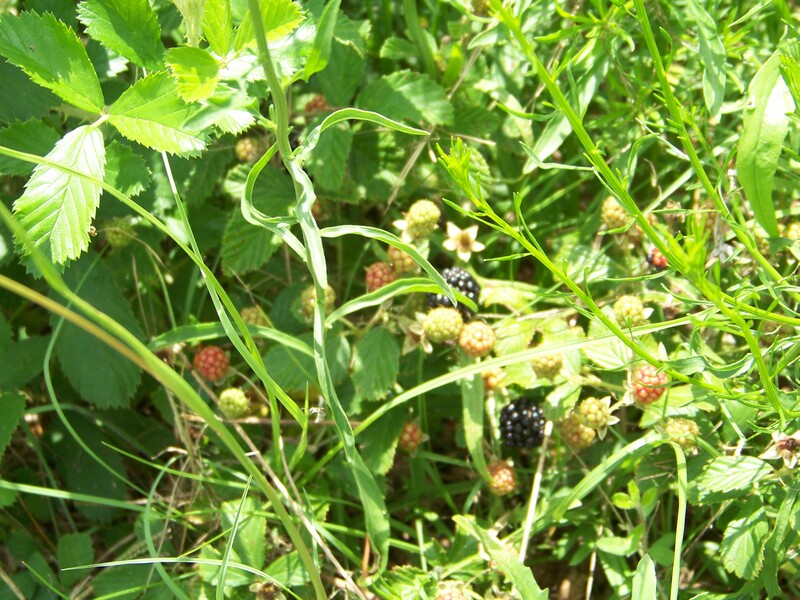 For every small cluster of black berries, there was an adjoining cane full of red and ivory berries. The season will be long and if the rains keep coming each afternoon, the berries will get bigger. I put up 7 half pints of pectin free seedless blackberry jam. I bought a Roma food mill two years ago; the hand cranked device makes a quick transformation of 10 cups of berries into seedless juice. I will repeat the berry collection and put the seedless juice in the freezer. Then off to the farmers’ market I ran to get eggs and a whole organic chicken, orange juice ambrosia and to peruse the other fare. I bought four pints of blueberries, some chevre (not for human consumption), purple onions, agapanthus, sweet shrubs and a few butterfly bushes. The sweet shrubs are a special find and I am so happy to add them to my garden. They will die back in the winter, send out runners and spread out over the years. Evie likes the agapanthus; he calls them fireworks flowers. He has an affinity for blue and indigo flowers in the garden and I will indulge him. Tomorrow we will rob the hive. 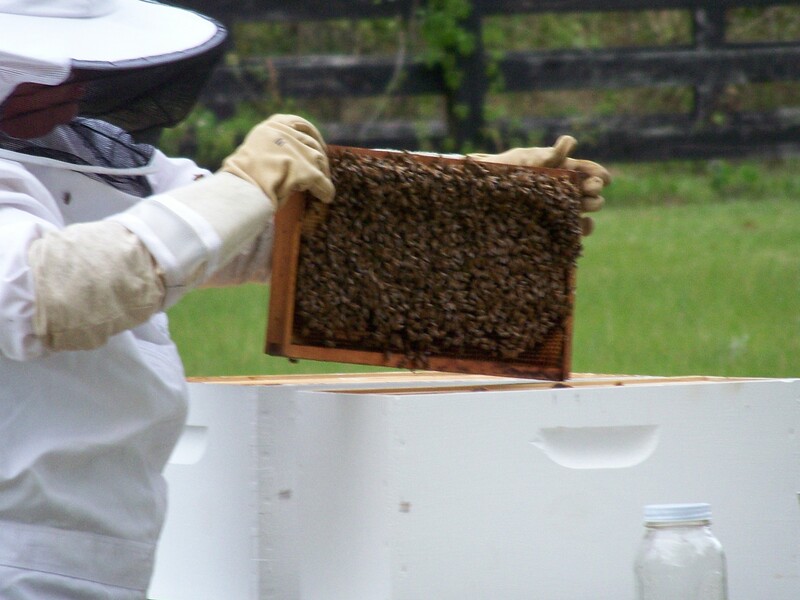 I am excited to see what my bees have produced in the last 10 months. I have recipes collected to use with my honey and may start with a honey challah tomorrow to eat with my black and blue berry jams. I recently read an article on Grist about women farmers and ranchers. I’m not a farmer but I want to grow some of my own food. I am rational, though. I don’t have the time to devote to a large kitchen garden. So, I pared down my goals and focused on a few things. 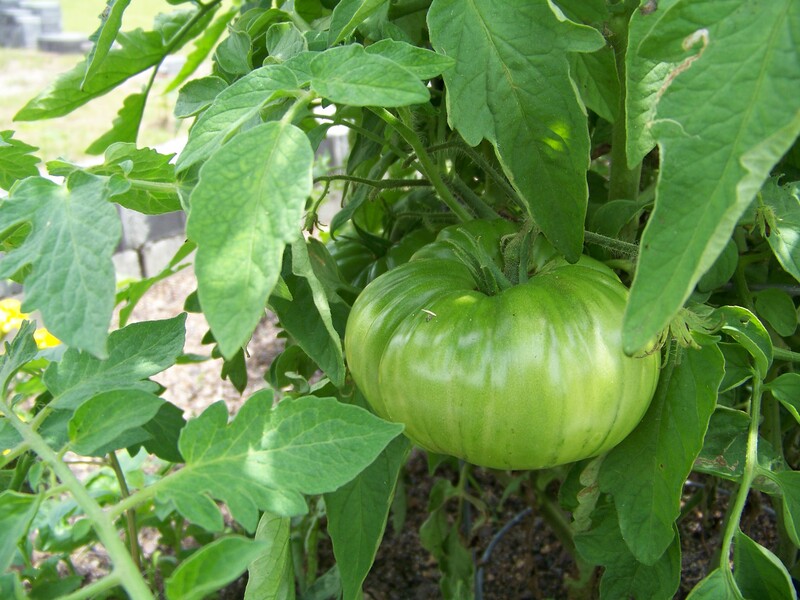 I want to grow tomatoes to can. I am not a fresh tomato eater as much as I am a cook that uses lots of tomatoes, mostly chopped tomatoes. So, I planted tomatoes and basil and peppers. My larger idea of food production is to grow fruit on trees to make jams, pies and cobblers. As fresh as can be from ground to plate (or freezer or water bath). And so this is a bit of what I have planted: three pears, six pecans, a loquat, six arbequina olives, a Meyer lemon, a peach, eight blueberry bushes and a tended, cultivated, replanted swath of wild blackberry brambles. 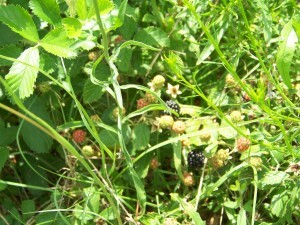 The blackberry canes grow wild all over my yard and I mow them over. 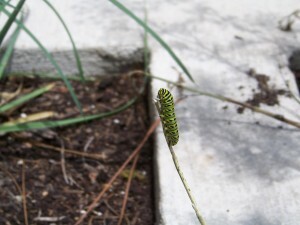 They also grow inside my landscaped beds. So, I dig them up and replant them into a band in the southern side acre. One day, the other 23 lots in Hawk’s Ridge will be built out and the wild, chest-high blackberry brambles will have gone the way of pine bark mulch and concrete pavers, but I will have a stripe large enough to satisfy my yearly jam making and pie baking. I also grow herbs for cooking: rosemary, oregano, thyme, garlic chives, sage, leeks and dill. The dill is currently serving at food source for the swallowtail butterfly caterpillars. 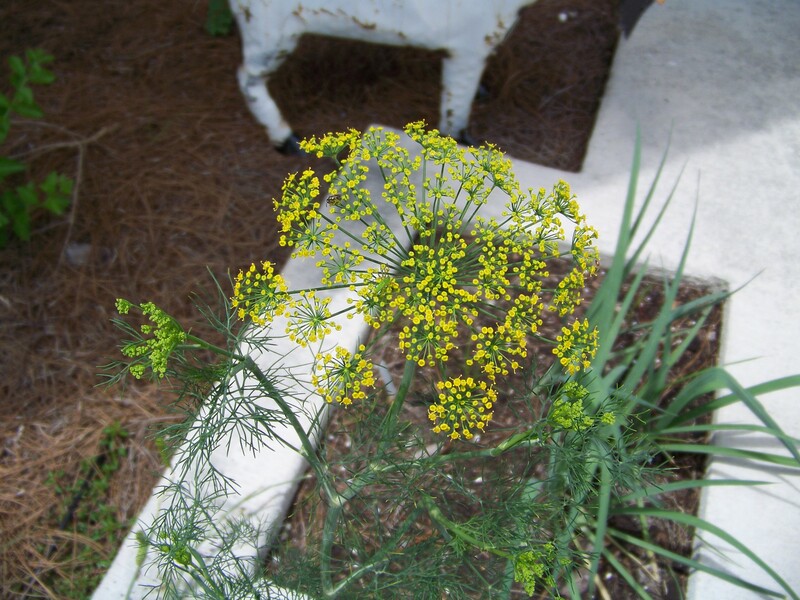 I bought two large seed packets of flower dill just for this purpose. 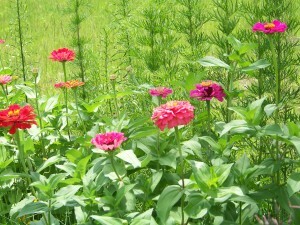 I will plant it in the late summer out in the rear acre far away from my herb garden for the kitchen. Lastly, I have bees. And honey that tastes of wildflowers and berries. The bees have plenty to forage with the lilies, asters, irises, cosmos, zinnias, blackberries, wildflowers and blooming grasses. It hasn’t been a year. I can envision the house and yard in three years, five, 10. The trees lush and grown, the garden mature, the beds packed with perennials leaving me to weed and transplant.